The key to getting an extra crispy and delicious coating on the chicken is double-dipping. 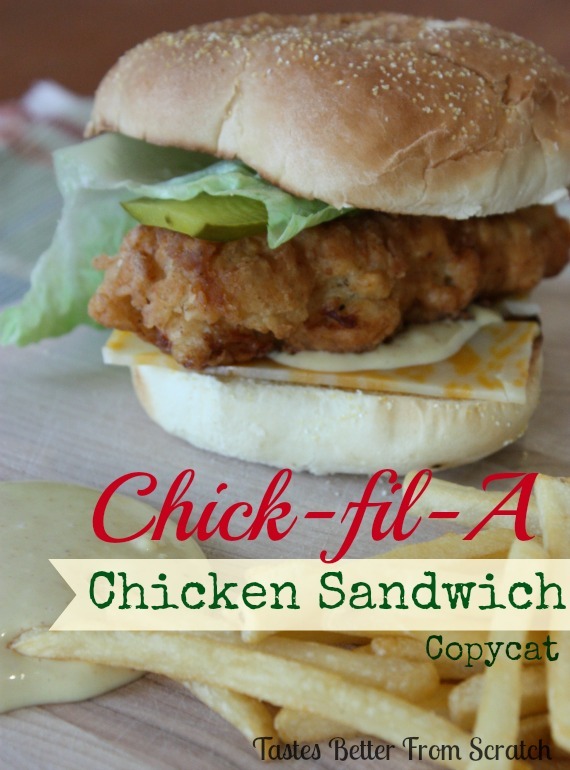 If you like your chicken spicy, directions are below for a Chick-fil-A Spicy Chicken Sandwich. We’ve included the recipe for homemade Chick-fil-A sauce. Combine the pickle juice and water in a zip lock bag. Add the chicken tenders and let marinate for 30 minutes. Make the Chick-fil-A sauce by combining all ingredients in a bowl. Mix well and set aside. Next, in a large bowl mix the breading ingredients together: flour, powdered sugar, paprika, black pepper, chili powder, salt, and baking powder. In another bowl mix the milk and egg. Heat 2-3 cups of oil in a large saucepan. Heat oil to about 350 degrees F.
Dip the marinated chicken tenders into the egg mixture, and then coat them in the flour breading mixture. Now repeat this step and dip that same chicken tender back into the egg mixture and then back into the flour again! Double dipping is how to make a super yummy, crispy sandwich! Place chicken in hot oil and fry for 3-4 minutes on each side. Remove to paper towel to dry. Toast the sandwich buns. Grab the Chick-fil-A sauce and smoother it on both sides of the buns. Top with lettuce, cheese, and crispy chicken! Enjoy!